The Embassy of Uzbekistan in Korea held the 27th anniversary of its independence at Lotte Hotel Seoul on 31 August. Uzbekistan withdrew from the former Soviet Union on 31 August 1991 and started anew as an independent nation. Many renowned political and economic leaders including the Korea-Uzbekistan Inter-Parliamentary Friendship Association chairman Byun Jae-il and the honorary consul of Uzbekistan in Korea Kim Chang-gun attended the ceremony on the day to grace the occasion. Uzbekistan and South Korea formed diplomatic ties in 1992 and has steadily increased cooperation in diplomacy and trade for the last 26 years. November last year, Uzbek President Shavkat Mirziyoyev visited Korea for 3 days and 4 nights and the two leaders checked on the cooperation and exchanges of the last 25 years and agreed to expand the level of the cooperation. They exchanged opinions on future economic development partnership and agreed to raise the current strategic partnership to a comprehensive partnership in politics, economy and personal exchanges. This indicated that the cooperation fields could include e-government, education, medicine, health and infrastructure in addition to the existing energy and resource sectors. A number of public state-owned companies and private businesses including the Korea Trade Insurance Corporation, Hyundai Engineering & Construction and POSCO also signed MOU for substantial cooperation on the occasion of the forum and the summit. 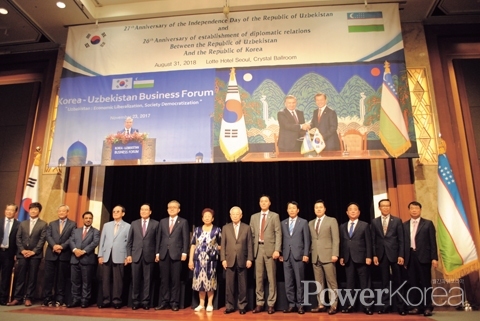 Korea is one of the top 5 trade partners of Uzbekistan, the third investor, and more than 400 Korean companies are currently operating in Uzbekistan. According to the Embassy of Uzbekistan in Korea, more than 35 out of the 400 Korean businesses in the local are engaged in car manufacturing and the Korea's investment volume has surpassed US $7 billion. There are 386 of 100% Korean-funded joint-ventures in Uzbekistan and the total number of the Korean businesses reaches 461 when added of the 75 already established Korean companies in the local. Most of them are related in the fields of tourism, logistics, information, communications, electricity, fabrics, machinery, chemistry, oil and gas. The embassy highlights that the US 4 billion dollar joint project of the Ustyurt Gas Chemical Complex, carried out by Uzbekistan and KOGAS, Lotte Chemical and STX, was successfully completed in 2015 and it is a landmark example of bilateral investment between the two countries. H.E. Vitaliy Fen, Ambassador of Uzbekistan in Korea, emphasized in his congratulatory message that Uzbekistan was one of the top countries in the world in terms of preserving precious metals, uranium, natural gas and fossil fuel; Korea National Oil Corporation was currently carrying out geological prospecting while other Korean companies were engaging in development of buried resources. The ambassador also pointed out that Uzbek universities were actively engaged in cooperation with more than 30 Korean science research institutes with Inha University in particular opened its branch in Tashkent in 2014 while many Uzbek educational institutions were planning to open Korean language courses and cultural centers. The Korea-Uzbekistan Inter-Parliamentary Friendship Association chairman Byun Jae-il delivered his congratulatory message on the day and hoped a stronger and more active exchanges and cooperation between the two countries. The event was closed by cake cutting and group photo followed by special performances and the attendees had an opportunity to see and taste Uzbek culture and cuisine.